Invisalign can be a great way to help you get the straight teeth and beautiful smile you desire without having to wear metal brackets and wires. With this treatment, clear, customized aligners are used to gradually reposition the teeth over the course of 1 to 2 years. In some cases, your dentist will recommend certain accessories to help the process along. 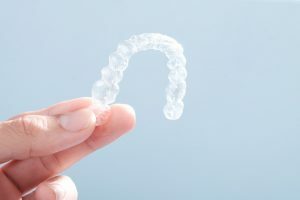 Keep reading to learn more about what Invisalign attachments and buttons are — and how to find out whether or not you will need them. By using Invisalign attachments, your dentist can move the teeth around more quickly with Invisalign. That often means a quicker treatment time for you, or less time spent wearing the aligners altogether — which is something everyone can enjoy. Invisalign attachments are small dots made out of translucent dental resin. They are strategically bonded onto the surface of particular teeth so that the aligners can better grip the teeth — ensuring maximum efficiency in the treatment process. Invisalign buttons are small brackets, also a translucent resin, to which rubber bands can be attached to help the teeth shift around according to the treatment plan. Of course, one of the best things about Invisalign is that it is subtle — and that doesn’t change with these additions. Both Invisalign attachments and Invisalign buttons are discreet enough that you can continue to speak and smile with confidence while you wear them. Plus, you still can (and should) take the aligners out before eating and drinking, even with attachments. You won’t have to sacrifice convenience or comfort in either case. Not every Invisalign case will need attachments or buttons. Some cases can be completed without these add-ons. The only way to find out whether or not you will need special attachments to complement your Invisalign treatment is to schedule an appointment with your Invisalign provider. During the consultation phase, your teeth will be evaluated and the treatment plan will be put in place — and, if you do need attachments or buttons, you can rest assured that the tooth-colored materials and small size will blend in beautifully with your natural smile. You have a lot to look forward to if you are getting Invisalign, including straight teeth and a confident smile! And, fortunately, attachments and buttons make the process more efficient than ever before — especially for complex cases. Kraft & Schrott Dental Associates offers comprehensive dental care, including Invisalign for patients of all ages and stages of life. To learn more about this clear aligner treatment, including whether or not you can benefit from Invisalign, do not hesitate to contact their office by calling (617) 227-4924!